Has your pet turned the water bowl into a swimming pool? Not only attractive as a feeding station, versus just having bowls sit on the floor to be pushed across the kitchen when your dog is eating - raised feeders may also have some health benefits for pets with complications. 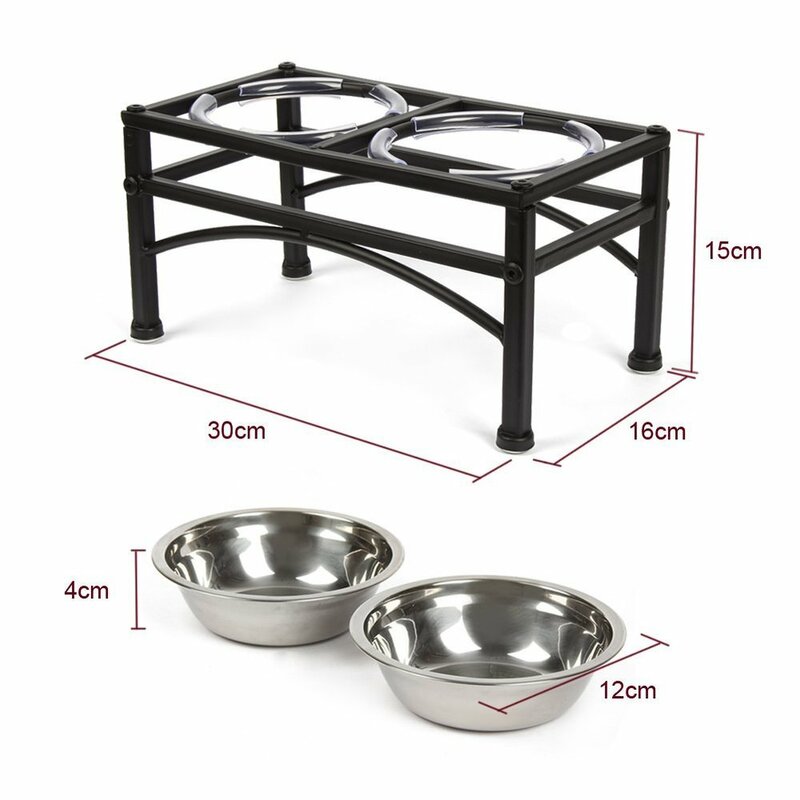 If a dog has a back, neck, or joint problem, a raised dog feeder at the appropriate height will help the dog to eat and drink more comfortably. At a higher position, the dog will not have to bend and stretch downward as far to reach the food or water. This is especially important for a dog with cervical IVDD, keeping the head as immobile as possible. When deciding on a feeding system that works for your individual pets, I think it's most important to discuss both pros and cons with your veterinarian. Much like people, dogs and cats are have very specific, personalized needs. Another benefit of a raised bowl system is the inability of the pet to dig or swim in the water dish due to it's height. Although I am sure that there are some dogs, and even a few cats (Jack and Jill, I am referring to you, haha!) that might still try to play with the water, most would be deterred by the height. This raised feeder was provided to me for review recently. Initially, out of the box it was extremely easy to assemble. I like the fact that it comes with bumpers which keep the metal, stainless steel bowls from rubbing on the frame. The feeder is well-constructed, sturdy and I really like the minimalist style design. It arrived to me in perfect, brand new condition with no dings, dents or bumps in the bowls or frame. I like the little feet on the bottom, which protect my porcelain tile floor. And it came with everything I needed to put it together, via an Alan wrench. The powder coating seems durable, so far. Measurements of bowls as well as height of the feeder. Upon reading the reviews it already has on Amazon, I have to disagree with the comments about the bowls not being big enough. I think they are the perfect size, and depth. I refresh my pet's water several times per day, washing the bowl each time, and feel that the amount of water that the dish holds is plenty in between those times. I would like to point out that unlike some other feeding stations, this one has bowls that drop down into openings, versus sitting on a flat surface where they have who knows what festering in the wetness underneath. Gak. Speaking of cleaning, the bowls pop into the dishwasher and come out sparkling clean. The frame is easy enough to wipe down with mild soap and water. Height is perfect for my 15 lb, 11 year old "tweenie", Lucy. I felt the height worked out well for both food and water for my largest dachshund, Lucy. She is about 15 pounds and considered to be a "tweenie" sized dachshund. My shorter dachshund, Molly had a hard time reaching the bowls. My cats also found the height to be perfect. They are both average size. To figure out which size is best, measure from the floor up to the point where your dog’s front legs meet the chest. This feeder actually lines up with Lucy's shoulders, but seemed to work out well for her. It doesn't tip or move while she is eating, though I do have it set up against the refridgerator. Overall, I found that the customer service with this company to be friendly and upbeat. At Funkeen, every product includes a 12-Month Warranty, 45-Day Money Back Guarantee and lifetime friendly customer service support. A minor issue to note, which would not deter me from buying the product was that the sticker inside of one of the bowls was somewhat difficult to remove.